When cooking many dishes you very often need something crushed, beaten or mix. I remember in our childhood we tried to make homemade smoothies, for that purpose we poured the ingredients in a jar, then closed and shook it in different directions. I must say it were cool cocktails. To prepare such beverages or other goodies in less exotic and more effectively way were created a special kitchen appliance – blender. For information on how to determine what is the best blender our story goes on. 3. Blender jar volume and material. In English the word «blender» means mixer, stirrer. Taking into account value of this word we can define this device. An electric blender is a kitchen small appliance designed for chopping, churning and mixing different types of products. Depending on the specifics of the device there are two main types of blenders: jar counter blenders and stick (hand or immersion) blenders. A jar counter blender. Such blender is composed of a special bowl and stand, where this bowl is placed. Products placed in a blender bowl and then they undergo necessary treatment. Stationary blenders are more designed to work with various liquids and are effective at mixing and churning. A stick hand blender is a hand-held device with elongated body, which is mounted on the end with the working attachment. Hand blender should be immersed in any container or receptacle. Immersion blenders are more efficient in the process of crushing, sometimes they may even perform some grinder functions. If you plan to use home blender for cocktails, cheese and other mass – buy jar counter model, if you want more often to grind something – choose stick portable blender. Personally, I would choose jar counter blender – it looks impressive. There is an electric motor in blender, which drives the work attachments. Power of this blender motor determines the speed and efficiency of its operations. More powerful blender can mix something more quickly. Now blenders are produced with 100-800 watts power mainly. The most powerful blender model that I have seen had 800 watts electric power. 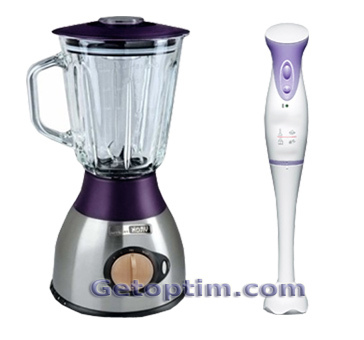 Considering the ratio of possibilities and prices we can recommend you to select blender with 500-600 watts power. Performance of certain blender operations depends on the blender speed nozzle rotation. In order to handle different products you also may need to use different speed modes. It can be from 2 to 15-16 speeds in blender. The higher speeds number is the better indicator, because you can always choose the most appropriate one. Many devices have so-called turbo mode, which can significantly increase blender speed for some time period. These characteristics are important for jar counter stationary blender models. Possible number of processed products depends from the volume of the jar. This is true not only for blenders, but also for other devices with jars, steamers for example. Blender jar volume can be from 0.5 to 2 liters. It is better to choose a larger jar volume (such as 1.5 l). You always can make a smaller portion of food in big jar, but on the contrary – you can’t. Jars can be made of plastic or glass. Glass jar less resistant to external damage, but the glass is the best material for food contact. It is better to choose a blender model with glass jar. If it isn’t possible look for high quality plastic jar produced by leading blender’s manufacturer. The number of blender nozzles depends on a variety of purposes of the instrument, because the blender nozzles are its main work item. A shredder nozzle is the main kitchen blender attachment nozzle, except shredder other nozzles can be in a blender set, such as whisk for whipping, nozzle-hook – for making dough and others. Blender’s manufacturers can produce models with very different nozzles, so you need to check their number. Blender control panel design and convenience. Walking on the above points, you will learn more about the basic functions of the blender, learn about the features of this device and then be able to buy a really good blender. Kamal: "Tahnk you for the information shared....! ..."
raghunathan: "Those days I could connect an external AKARI ..."
sahim: "Li polymer is better.. i have one in my mobil ..."
Abhijeet ganguly: "Li ion ..."